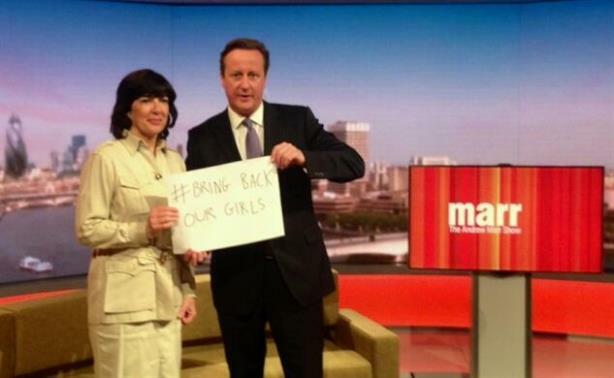 Prime Minister David Cameron showed his support for the '#BringBackOurGirls' pressure campaign on Sunday, holding up a sign bearing the slogan on the BBC's Andrew Marr Show. He was handed the sign by fellow guest Christiane Amanpour, CNN's chief international correspondent, who asked if he would like to join the campaign, to which he replied: "Happily." He later tweeted: "Proud to support #BringBackOurGirls." US First Lady Michelle Obama is among other high-profile supporters of the social media campaign, which is calling for the rescue of 200 Nigerian schoolgirls who have been kidnapped by militant Islamist group Boko Haram. No-one can fail to have been deeply shocked by the kidnapping of more than 200 young girls by Islamist extremists in Nigeria. So anything the Prime Minister can do to raise the profile of the issue and increase the international pressure on Boko Haram has got to be good, right? David Cameron concluded that he could not afford to look uncaring and when coming from pressure groups or the public, the use of hashtags can be an effective tool to raise profile and coalesce supporters. But from Presidents and Prime Ministers with military and financial resources at their command it does little more than highlight their impotence and their unwillingness to put those resources to use. Cameron might get some short-term benefit but in the long-term the appearance of being powerless and helpless can only diminish him, his office and ultimately the country.